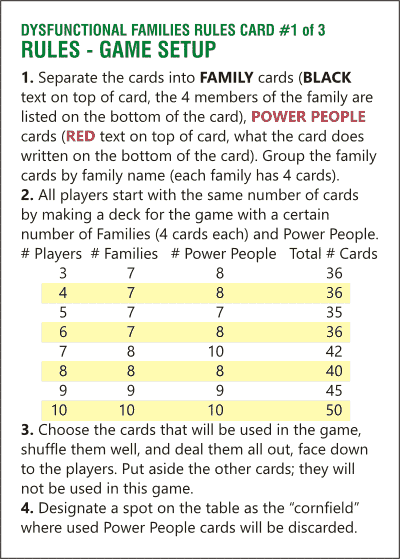 Dysfunctional Families is a card game for 3 to 10 players. Game time about 45 minutes. The game is loosely based on Happy Families, a traditional card game from the 1800’s similar to Go Fish!. However, Dysfunctional Families has some very un-1800’s twists. The original Happy Families was about collecting cards of families with traditional occupations such as the Butchers, the Bakers, and the Candlestick Makers. Dysfunctional Families includes families like the Arsonists, the Drug Dealers, the Mad Scientists, and the Zombies. 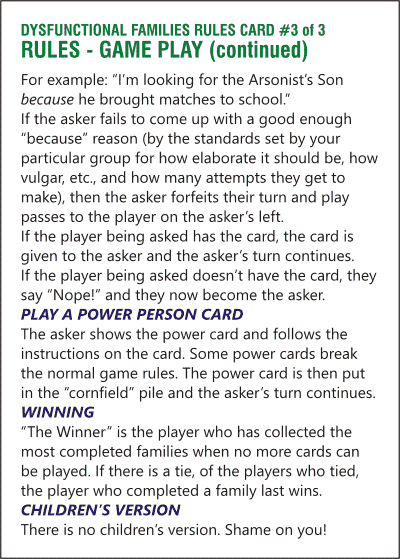 This is a simple structured improv where all that’s needed is filling in the “because” — so it is easy for players to catch on — yet because of the Dysfunctional Families, it can bring out some wild sentences. These both serve to keep the laughs going as well as help astute players remember what cards the other players are trying to locate. I’m looking for the Arsonist because I have some inventory that needs to go up in smoke. I’m looking for the Arsonist’s wife because I want her flambé recipe. I’m looking for the Arsonist’s son because the Boy Scouts don’t know how to start a campfire. I’m looking for the Arsonist’s daughter because I need a hot prom date. 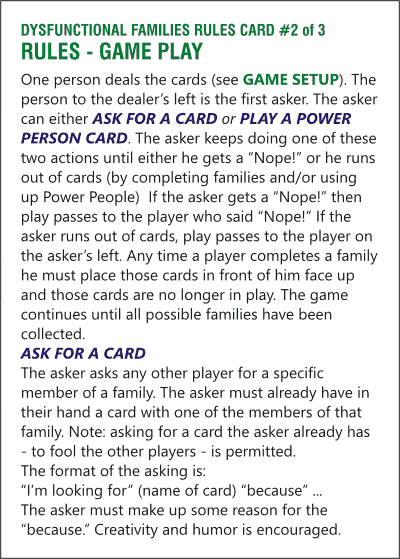 There are also Power People cards. These cards cause players to reveal information or cause cards to move around. Applied skillfully, they can be used to determine who is holding the cards you need or to mess up the hand of a player who is doing too well. Sign up for the email list to get all the updates and a free Print and Play copy of the game! And you’ll be able to get a full-color printed copy of the game from the Kickstarter campaign! Launching on Kickstarter Monday January 2, 2017!